The endless flow of staring faces that form Blue Gaze installation echoes the profusion of selfies flooding daily existence. 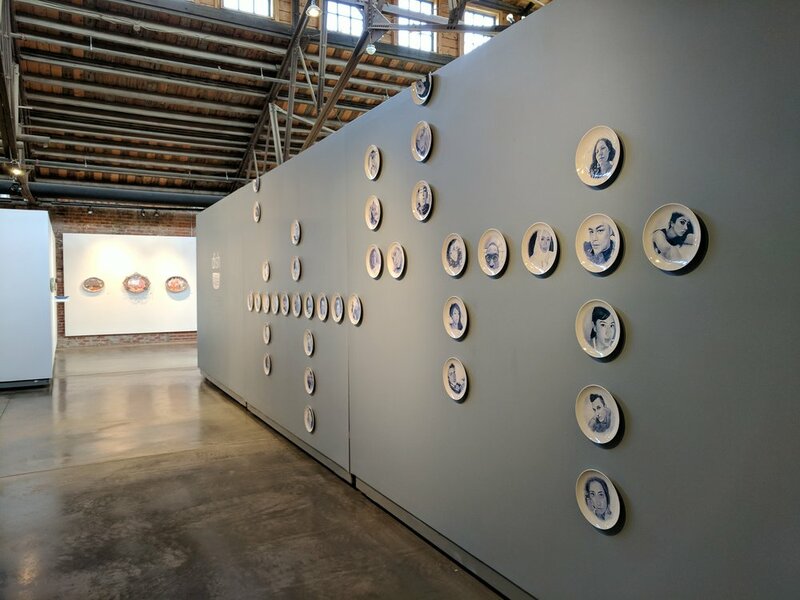 The multiple plates display monochromatic self-portraits of public figures who frequently publish personal photographs on social media. Each informal image portrays a seemingly mundane moment, while providing a luring illusion of intimacy to the millions of followers who receive it. Referencing the historical role of ceramic wares as a form of cultural documentation, the installation inspects contemporary social patterns and asks what heritage the ceramic plates of the digital age should reflect. If self-documentation and the selfie phenomenon occupy so much of humanity’s time and attention, are they worthy of encapsulation in a tangible, fragile object? To reflect the hasty and immediate nature of the selfies, the installation appears like a one-take piece, created in an automated, hands-off production line. Just as the selfies, the plates are somewhat insincere; The hand-painted portraits were in fact rendered by an automated algorithm of a mobile app, the decal blue diverges slightly from the familiar Cobalt, and the plates are deliberately a generic IKEA design. Nevertheless, the strong artificial aftertaste that arises from the installation is in fact a form of truth. It is the universal attempt to experience one’s self as an object that is seen - a direct stare at the existential abyss.